Home renovators and leading builders have come to trust our line of first quality home decorating products. At Trending Home Décor we’re proud of our reputation as a trusted e-commerce site operated by Canadians and featuring Canadian made sawn barn doors and the best in barn door hardware available in today’s marketplace. 42" x 84" x 1-3/8"
Includes 6" x 80" headerboard finished to match the door. Includes free delivery in the GTA. Barn doors have become very popular recently for several reasons. They provide a distinctive and stylish addition to your home, cottage or office and they take up less space than the traditional door hung in hinges. You’ll find them attractive and efficient for use in bathrooms, dens, living or dining rooms. They provide privacy and as they hug the wall when opened or closed they take up very little interior physical or visual space in any room. To meet your decorating needs we offer an interesting range of real sliding barn doors in a variety of sizes and finishes. Why not take a minute and consider your options in contemporary barn doors by looking at the attractive sawn barn doors available here at Trending Home. If you live in the GTA and order any of our real sliding barn doors you can pick your new door in a matter of days. 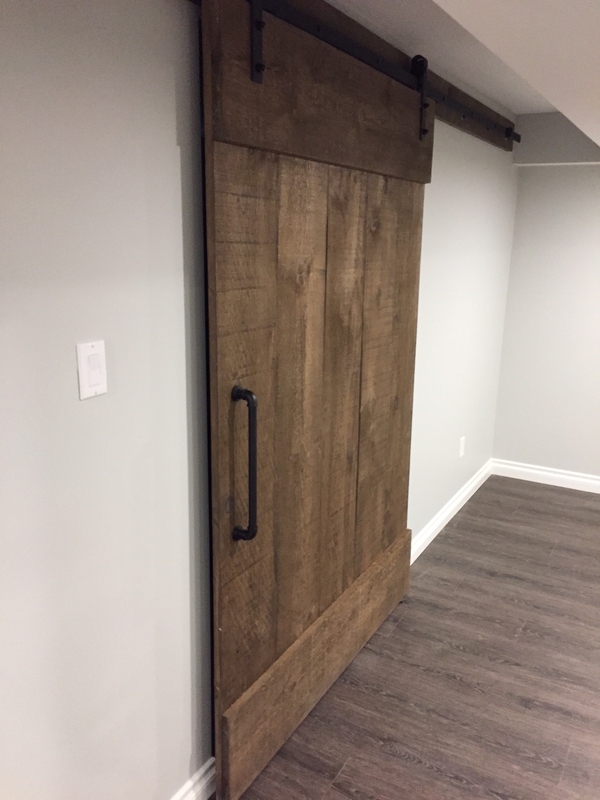 If you’d like us to deliver your rough sawn barn door, or your Canadian classic pine door, or any of our other contemporary barn door models you can have them delivered to your home or office ready to hang in 10-14 days. Our wide range of contemporary barn doors come in several stock sizes that fit most door frames. But if you need a larger or smaller real sliding barn door we can accommodate your needs with a custom sliding barn door. In Toronto, we can have your custom Canadian classic pine door or your custom ruff sawn barn door most often delivered in about two weeks. While there is an extra charge for custom contemporary sliding barn doors in Toronto and beyond, we think you’ll agree that our prices are attractive and competitive with other suppliers. Many of our doors come in a variety of finishes and textures depending upon the design effect you wish to create. You’ll find that with our wide range of contemporary barn doors there is one to fit your exact needs as far as size, finish and design are concerned. Once your Canadian classic pine door or your rough sawn barn door arrives you’ll need to hang it. At Trending Home Decor we offer an interesting range of real sliding barn door hardware that’s attractive and designed to provide you with many years of trouble free service. Installation can be done quite easily with tools that most people have around their homes. First of all, take a look at the brief but informative installation video you’ll find on our website. You’ll see that there only a few logical steps needed to have your new sawn barn door up and running smoothly in no time at all. Round up a drill, a level, a tape measure, an Allen key to install the track stops, and a screw driver and you’re ready to go. With the instructive video and a bit of handyman ‘know-how’ you’re in business. But, if you have questions, or run into trouble, you can always chat on our website with Dave our barn door tech support specialist. He’s there to help you with any ordering or installation questions you may have. The Canadian Classic Pine Door is one of our best sellers. You’ll understand why when you see it illustrated on our website. Its clean lines and stunning appearance will add a touch of class to any room in your home, cottage or office. Its elegant but simple construction guarantee you many years of successful use. Available in several widths and finishes to match your door frame and the colour scheme in your home, you can choose the finished appearance that will most effectively contribute to the appearance of your room. When you select either the black metal or the stainless steel hardware package to hang your Canadian classic pine door you have the final say in the mood or tone you wish to set with this attractive addition to any room. If by chance our standard sizes in our Canadian classic pine door don’t meet your needs, we can custom build one for you to fit your door frame and reflect the colour or stain that will enhance your room. At Trending Home Décor we’re proud of our reputation for quality design products and our fast dependable delivery. For further information, or to place your order, get in touch with us at dave@trendinghome.com or at www.trendinghome.com of give us a call at 1-647-457-6011. We’ll be pleased to serve you.